On the morning of Thursday, January 24, 2019, ten outstanding IHA students were recognized with Soaring Eagle Awards for the second half of the first semester. 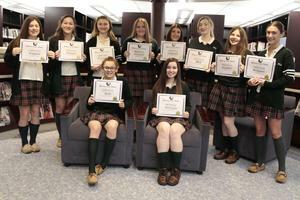 Standing, left to right, are Courtney Driscoll’19 (English – Ms. Maureen McNulty), Patricia Christensen’19 (Mathematics – Mr. John Millard), Gabriele Welp’19 (Technology – Mrs. Theresa Seymour Dolan’95), Michelle Marino’21 (Physical Education - Mrs. Terry Skjold), Vanessa Pecora’21 (Communications – Mr. Phil Bernardi), Nicole Krumrei’20 (The Arts - Mrs. Mary Carnevale), Barbara Mattura’21 (Social Studies - Ms. Lia Kunnapas'09), and Patricia Durante’19 (Religious Studies - Ms. Geri Braden). Seated, left to right, are Sydney Severini’22 (Science - Dr. Erika Brennan) and Sophia Ruggier’20 (World Languages – Dr. Arta Boutcher). Congratulations, ladies! Click here to view the full photo album.